Hello again! 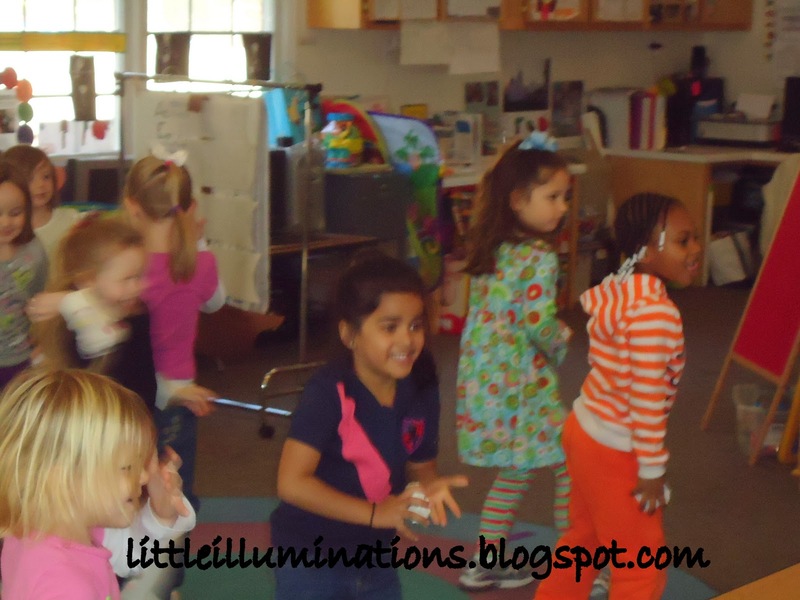 I'm Ayn and I am a Ga. Pre-K teacher, serving 4 and 5 year olds in an inclusive setting. I share my classroom adventures on my blog, little illuminations. 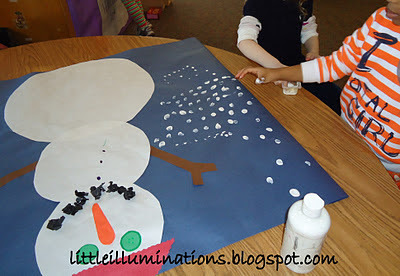 Several years ago, when I taught preschool in New Jersey, we would have snow frequently in the winter. We'd have an initial "SNOW DAY", but a day or two later, the roads were cleared and school would be back in session. 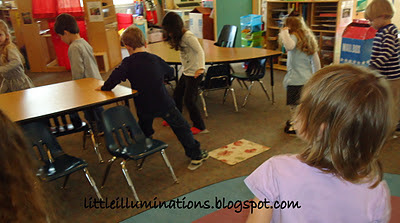 Often, we'd have snow on the ground to explore with during recess and nature walks. But here in Georgia, our "SNOW DAYS" are few and far between. We rarely get enough snow to stick to the ground long enough to make a snowman, and if we do, it's melted before we've even had a chance to return to school. This year, I planned a "SNOW DAY" ~ a "FAUX SNOW DAY"!!!!! 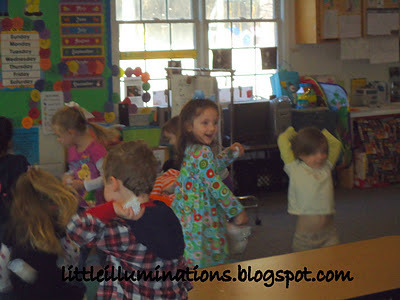 We ice skated to classical music around our classroom. I gave each student 2 pieces of wax paper, cut in rectangles just about the size of their shoe. We put one piece under each shoe and away we skated! It was a wonderful simulation and allowed us to exercise all those muscles used in "regular" ice skating! We built a faux snowman. I gave the children a few shape cut outs and they put the snowman together. They added a little "faux snow" fingerprints to complete the scene. No snow day (or "FAUX SNOW DAY", for that matter), would be complete without a good old fashioned SNOWBALL FIGHT!!! We collected some old paper from our recycling bin and crumpled it up to make snowballs. We squared off girls against the boys and went to town. Any snowballs that landed were fair game to be used again! Snow or "faux snow" , we all need a snow day every now and then! Stop by and visit me anytime at littleilluminations.blogspot.com or visit the little illuminations fanpage on facebook! Oh Ayn, I'm going to have to have some Faux Snow Days. As you can imagine, we don't get any snow days here. Well we do in some parts, but not anywhere near where I am. It will be a wonderfully unique experience for me & the children. Thanks for sowing that seed. YAY - our wellness teacher lets them "skate" on paper plates! And I'll vouch for Ayn, this idea is a HIT with the southern sector that rarely scores snow! Awesome post, Ayn; thanks for sharing!! Saw your post on pinterest. We don't get much snow in Houston either. I love the wax paper idea. 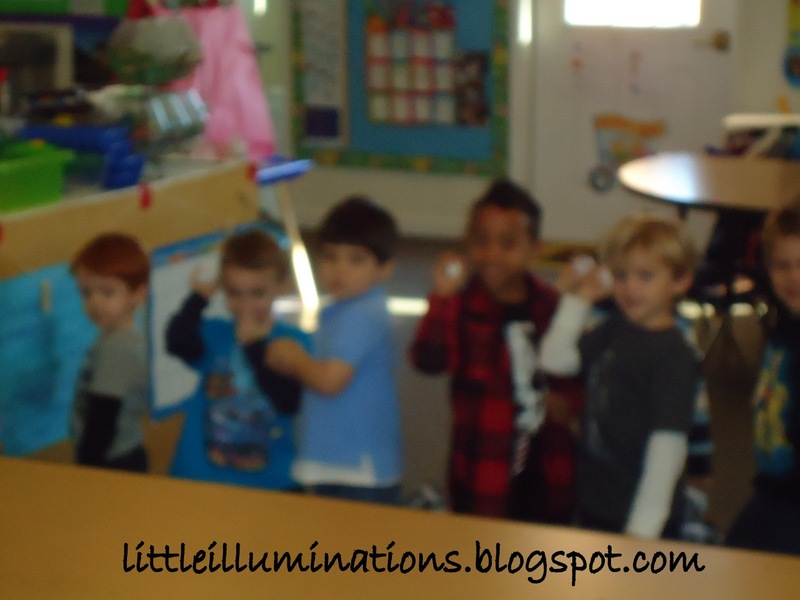 We have had "snowball" fights with sock balls during our winter party. 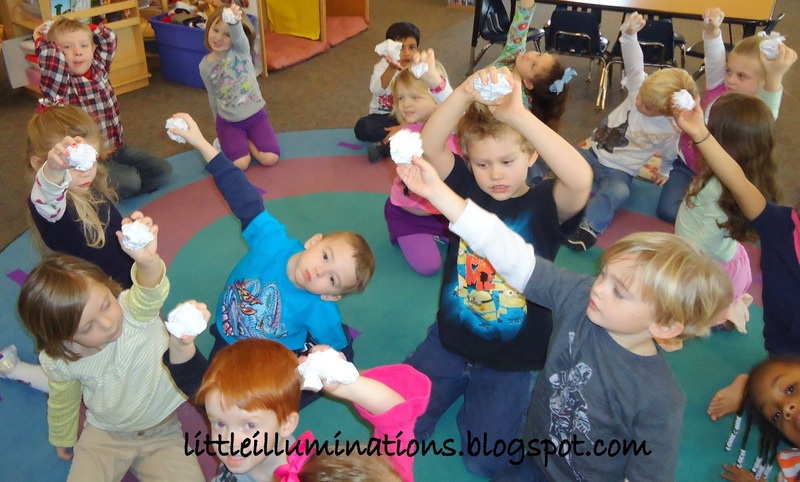 I have a Snowball Freeze Fight year-round in my concerts! I have recorded "Let It Snow" with FREEZE pauses built in on my "Dancing Feet" - check it out at macaronisoup.com. We use the net poufs - louffa's - for snowballs - no one can get hurt with them, and they are easily washable and are great as popcorn on a parachute, too! Check this out - it was the Song of the Month on my website January 2010: http://macaronisoup.com/Songs/January2010.htm.